It's finally starting to rain in California. That's amazing news for our water supply and the Sierra Nevada snowpack. Unfortunately it's putting a damper on my weekend trips to the flea market. I was especially bummed out that I missed out on De Anza last weekend. That's my personal favorite and since it's only once a month, I'll need to wait three more weeks to get my fix. But not to worry. I actually have one purchase to share from a few weeks ago... and a few other recent pickups that are semi-related to that flea market find. 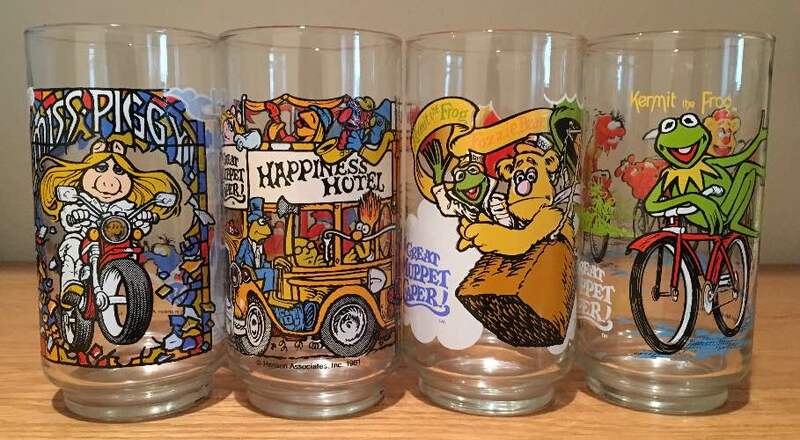 I've never been a huge fan of the Muppets, but I remember owning a couple of these when I was a kid. The vendor was this cute elderly lady who was selling off her keepsakes. We talked for about five minutes and I knew I needed to buy something from her. Now I just need to figure out what to do with them. Should 43 year old men really use cups with puppets on them? This is a huge addition to my Star Wars collection. I was a little disappointed to find out that Topps didn't have Frank Oz sign these... but oh well. 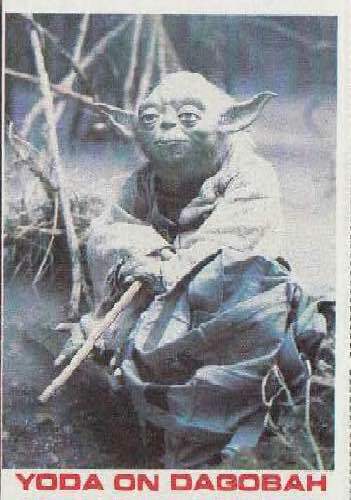 Hard signed Yoda cards don't grow on trees. 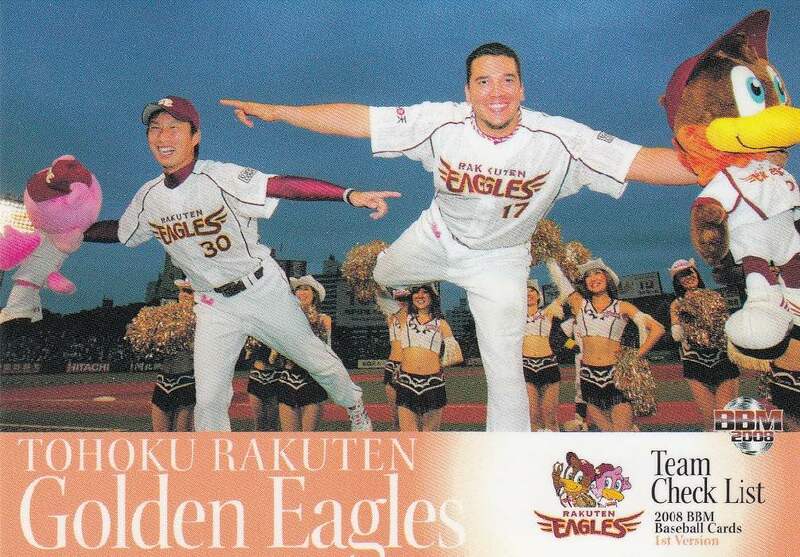 Thanks Todd for the awesome Golden Eagles team checklist. I'll be showing off more singles from your care package in future posts. 43-year-old men definitely shouldn't use glasses with Muppets on them, but it's 100% alright for 40-year-old men to do so. 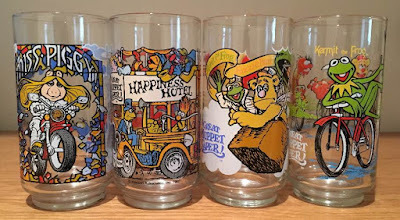 If you ever feel like turning those glasses into some cards, let me know. Maybe I can dig something up from my more recent purchases. I know shipping would be a bit of a killer on them because of the weight, but I'd definitely make up for it in whatever I sent you. That Eagles checklist is one for the ages! 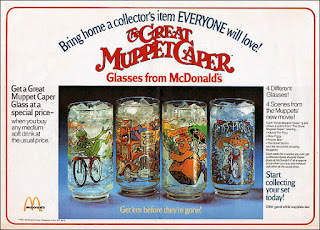 Loved the Muppet Show, can take or leave the Great Muppet Caper, the glasses are pretty cool... But I could easily see myself buying something like them, getting them home and saying "....Now what?" 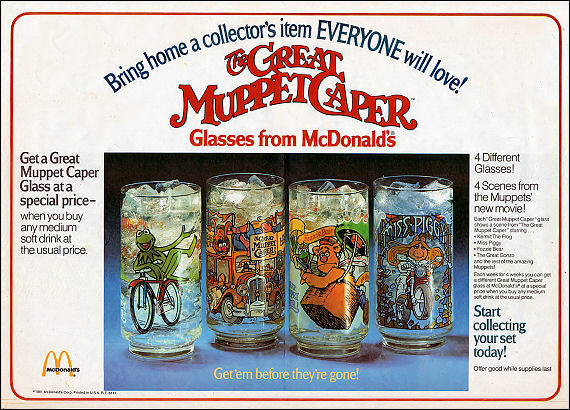 Obligatory They Might Be Giants reference: "Put your hand inside, put your hand inside, put your hand inside the puppet head"
I remember having the Kermit glass, those glasses always seemed so fragile. 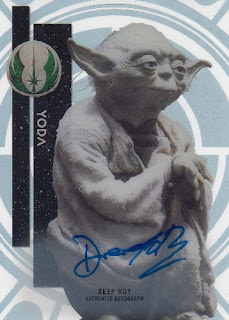 I was bummed about the Yoda autograph too, how could Topps go with the actor that played Yoda in about 30 seconds worth of movie time over the voice of Yoda? offy - my friend and her daughters are going to use them for flower pots. however... if and when she returns them, i'll keep you in mind. shlabotnik - love me some they might be giants. never knew how to categorize their music... but it was one of my favorite groups in college. as for the eagles checklist card... that's just one of a handful that todd sent me. I'm slowly going to share them... but they truly are awesome. corky - yeah... my first thought was to flip them on eBay... but then i'm afraid they'd crack during the shipping process. 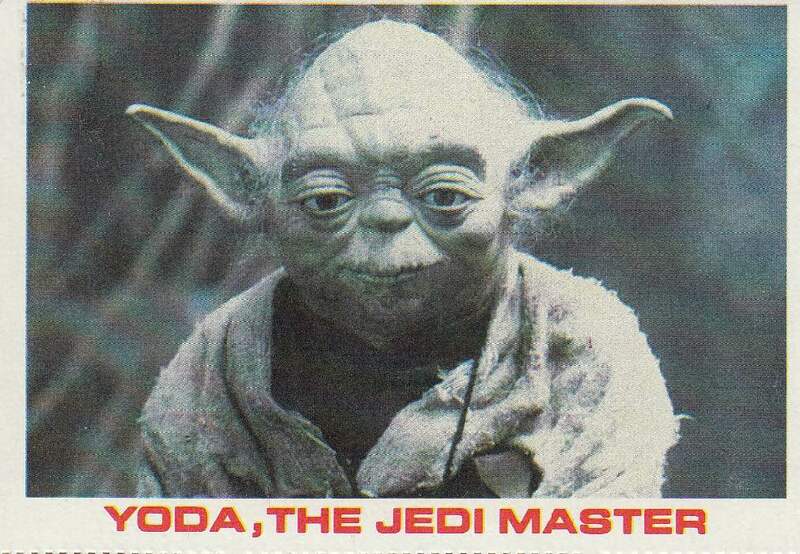 as for the yoda... topps definitely dropped the ball.